Lots of flavor without a lot of calories. The (optional) addition of gin to this recipe helps boost the spice. 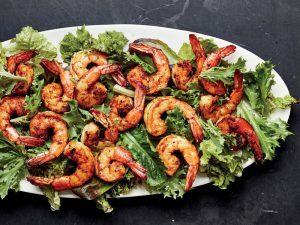 Pat shrimp dry with paper towels and place on a plate or shallow dish. Stir together gin, garlic, ginger, sugar, cayenne, black pepper, cumin, cinnamon, turmeric, and cloves in a bowl. Rub spice paste all over shrimp. Let stand at room temperature 30 minutes. Heat a large well-seasoned carbon steel or cast-iron skillet over high. Add 2 teaspoons oil and swirl to coat. When shimmering, add half of the shrimp in a single layer. Cook, without stirring, until shrimp have curled and there are some rich browned spots underneath, about 2 minutes. Turn and cook, stirring often, until spices are fried and shrimp are cooked through, 1 to 2 minutes. 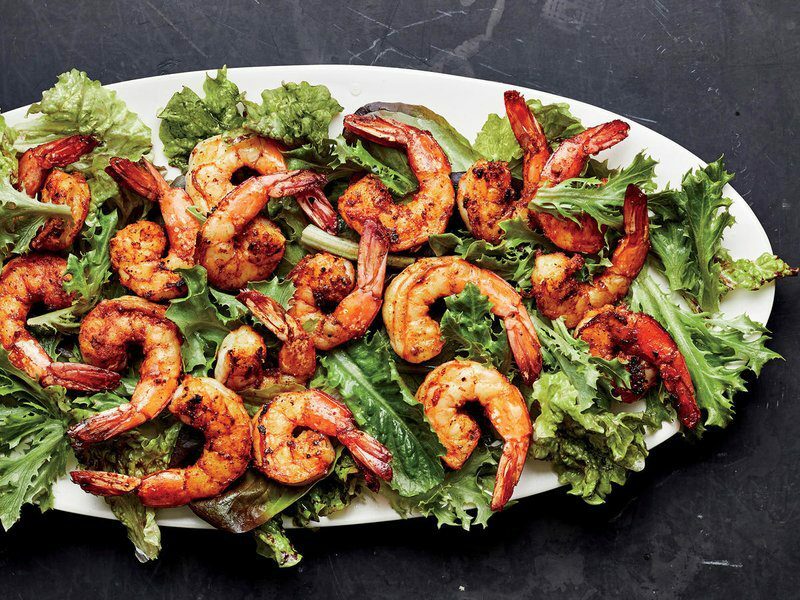 Remove shrimp to a plate, scraping out all the spice bits from skillet. Quickly wash the skillet before repeating cooking process with 2 teaspoons oil and remaining shrimp. When done, sprinkle shrimp with salt and 1 tablespoon lemon juice. Toss together lettuce mix, remaining 2 teaspoons oil, and remaining 1 1/2 teaspoons lemon juice in a bowl. Arrange on a platter. Top with the shrimp, and serve. Instead of grilling this recipe in a pan, you can cook the skewers under the broiler. Combine first 9 ingredients in a bowl. Add shrimp; toss to coat. Cover and marinate in refrigerator 15 minutes. 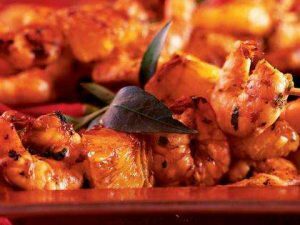 Remove shrimp from dish, reserving marinade. Thread shrimp and orange quarters alternately onto each of 8 (8-inch) skewers. Heat large grill pan coated with cooking spray over medium-high heat. Cook skewers 4 minutes on each side or until done, basting with reserved marinade. Try these healthy tacos — this recipe will definitely bring rave reviews! Defrost prawns and remove tails. Place in shallow dish with wine and sprinkle with taco seasoning. Marinate for about 1 hour. Drain prawns thoroughly. Sauté in olive oil until just cooked, do not overcook. Lightly coat a pan with cooking spray and cook each tortillas on both sides until toasty warm. Add prawns. 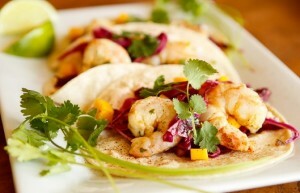 Garnish with lime wedges and cilantro. Making tomato water sounds fancy, but all you do is collect the juices from chopped ripe tomatoes. It’s a delicious addition to seafood or any vinaigrette dressing. Place tomatoes in fine-mesh sieve set over a medium bowl; season with salt. Let sit, stirring occasionally, until about 3/4 cup tomato water has collected in bowl, 30-40 minutes. Remove side muscle from scallops, pat dry. Heat oil in a large skillet over medium-high heat. Season scallops with a pinch of salt and sear until deeply browned, about 2 minutes. Turn and cook until just opaque on other side, about 30 seconds. Drain on paper towels 1 minute. Divide scallops among large shallow bowls and spoon tomato water around. Squeeze lime over scallops; garnish with mint.